Why Pick Tough Dog Toys? If you are planning to buy tough dog toys as special presents for your German Shepherd it is recommended that you pick only fun, safe, and long lasting dog toys. These kinds of dog toys are important in keeping your dogs happy and occupied. They are also perfect to help stop your dogs barking problems as well as their bad chewing habits. Dogs do not literally care if the toys are expensive or attractive or name brands. As long as they are worth their playtime, they're okay with them. Tough dog toys are the best choice as they don't easily tear up or get damaged. They can keep your dog company for a long period of time. With durable toys, you'll probably wait for months before you go and buy a new one instead of days or weeks. This does not only free you from making constant toy purchases, but it does ensure that your dog will always have a fun and safe playtime. There are large varieties of tough dog toys available on the market. What your dogs really need are interesting and long lasting dog toys that will match their aggressive urges. And not just that. They also need dog toys that will leave them no choice of chewing something else around the house. When buying durable dog toys, pick ones that you think are safe and will be highly useful. Dog toys don't necessarily need to be expensive. The thing is that, dog toys should foster healthy development of your German Shepherd puppy. Since dogs love to bite, chew and carry around their toys, it is a must that you choose sturdy dog toys. This doesn't mean however, that you pick extremely hard dog toys as this can cause damage to your puppies teeth. Dental health is important so only buy dog toys that suit your individual dog. With the right dog chew toys, your pups dental health will be greatly improved. More than just the durability issue, sturdy dog toys need to also be entertaining. Of course dog toys should be interesting to catch the attention of your pet otherwise they'll be useless. While some long lasting dog toys are made to make enticing sounds, some light up, some are plush, while others are made with something that feels good to chew on so there is a wide variety. With all these features, there is no doubt that these dog toys will make perfect presents for your German Shepherd. Once you've picked the perfect dog toys that are fun, you can use them to reward your dog for good behavior or take them away as punishment for bad behavior. Before you go and shop for any dog toys, it would be wise if you first knew what your dog would like and what would suit him. Some dogs prefer plush dog toys while others don't like them at all. If you're unsure you can ask an expert to help you identify the right tough dog toys for your dog. You should understand that different dog breeds have different wants and traits. So it is a must that you know your dog so as to come up with the right kind of toys. By knowing your puppy well it is a sure thing that you will find just the perfect dog toys for your pet dog. 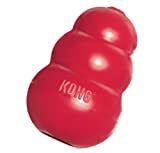 With the myriad of choices, definitely you can find sturdy dog toys that are custom made for your most loved pup and on this page I'll recommend my favorite of all - the Kong family of dog toys. 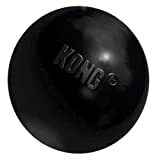 I've bought them for my dogs for years and I like them because they are long lasting, sturdy and the dogs enjoy them - plus, now you can buy many different styles of Kongs.